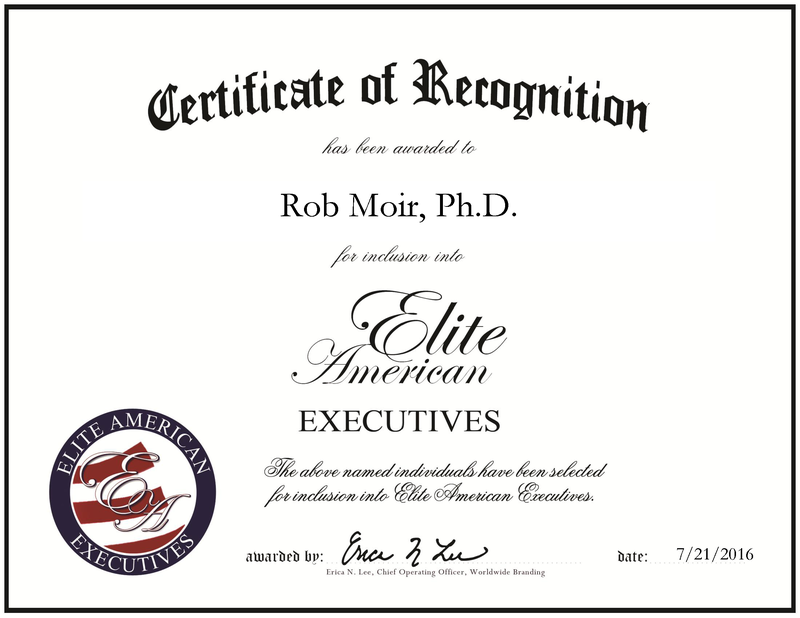 Cambridge, MA, July 21, 2016, Rob Moir, Director of the Ocean River Institute, has been recognized by Elite American Executives, for dedication, achievement and leadership in nonprofit environmental organization. Dr. Moir has contributed 40 years of experience to supporting various environmental groups, citizen science training, environmental monitoring, survey and assessment, and collaborative eco-system based management, bio-regional planning and management and ecosystem and wildlife stewardship. His work has resulted in institutional changes and marine policy success, due to his commitment to save oceanic ecosystems with the help of local, regional and international groups. His greatest accomplishments stem from initiating bioregional and ecosystem-based collaborative management, an engaged constituency of citizens, scientists and eco-savvy residents to improve the life-qualities of specific places. This is exhibited in such work s as the north shore of the Massachusetts Bay as “Salem Sound,” where he brought together six municipalities to manage in a concerted effort. In addition, he lead a successful initiative to educate and broaden a constituency in Massachusetts supporting comprehensive area-based management of state coastal water. The efforts of Dr. Moir to lead clean ups of Salem Sound and Boston Harbor was aided by his work with the Ocean River Institute and past organizations he has served as president, the Salem Sound Harbor Monitors, Salem Sound 2000 and Save the Harbor/Save the Bay. In addition to his service with these organizations, Dr. Moir was the curator of natural history at the Peabody Essex Museum, a curator of education at the New England Aquarium and an executive director of the Discovery Museums in Action of Massachusetts. He was the first assistant scientist with the Sea Education Association to work consecutive voyages aboard the research vessel Westward in 1979 and 1980. His stance on conservation efforts is concluded from his drive to make lives for humans and wildlife better. To reach more audiences, Dr. Moir hosts an internet talk podcast free on iTunes, Moir’s Environmental Dialogues, Ocean River Shields of Achilles. He endeavors to enlist and engage citizens and families as eco-stewards to create clean and healthy environments. He hopes with more people involved, the government will pass more regulations to help manage natural resources, including oceans, rivers and watersheds. Dr. Moir graduated from Antioch University New England, earning a Ph.D. in environmental studies in 2002 and a Master of Science in teaching in 1979. He attended Hampshire College, and earned a Bachelor of Arts in natural science in 1977. Dr. Moir has also studied at the Marine Biological Laboratory in Woods Hole, Massachusetts and at the USC Wrigley Institute for Environmental Studies on Cataline Island, California. He remains active on Boston Harbor Island’s National Park Service Advisory Committee, serving on the partnership. In addition, he was honored in 2011 at the National Marine Sanctuary Foundation Capitol Hill Ocean Week Dinner for his work with the Stellwagen Bank National Marine Sanctuary. Additionally, Dr. Moir is the founding chairman of Ocean Champions. In 2016, Ocean Champions and David Wilmot were named recipients of the Excellence in Policy Award presented by The Peter Benchley Ocean Awards. Dr. Barbara A. Block, a former student of Dr. Moir’s, received the 2016 Excellence in Science Award. Together, they had sailed on Sea Education Association’s research vessel Westward cruise W49. Other awards Dr. Moir has received include the Switzer Environmental Fellowship from Robert & Patricia Switzer Foundation in 1996, and the James Centorino Award for Distinguished Performance in Marine Education from the National Marine Educators Association in 1988. This entry was posted in Education, Environment, Nonprofit, Project Management and tagged conservation, ecosystems, Environment, marine, nonprofit, ocean, ocean river institute. Bookmark the permalink.